"ECONOMIC crisis or not, people need to eat good food. This thinking is what drives many food companies to continue expanding despite the gloomy outlook for the economy this year. Meehan Cellars, a three-year-old firm supplying wines to restaurants and hotels, has invested some P50 million in butchery equipment and facilities to be able to process their own delicatessen meat products. I live in Pacific and so I've been the their One McKinley branch often enough to have basis to form an opinion. it is absolutely horrible. The place it to be avoided. Not worth the money. anonymous said the place is "absolutely horrible; the place it (sic) to be avoided." 1st anonymous did not elaborate or explain what makes dinelli horrible and why "it to (sic) be avoided" and "not worth the money." can you pls explain why? for me, words said by anyone who hides behind anonymity isn't worth a hoot. anyone can say anything and i even wonder why the author of this blog allowed this comment to be published in her blog. could it be that you are a competitor of dinelli and are threatened by the latter? are you out to destroy a competitor's reputation? Let me assure you that I am not a "competitor of dinelli", whoever that is. 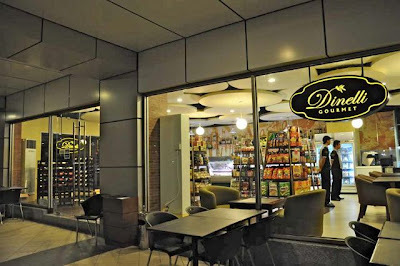 If you take a look at the blog archives, you will find a previous story on dinelli's opening in Timog. Btw, the owner Anthony Meehan has been apprised of the comment and doesn't feel overly bothered by it, so I don't think you should be also. I'm just glad that he and his wife listen to suggestions for improvement, and are confident enough to take such negative remarks in stride. With the kind of business they are in, he knows he can't please everybody. Thank you for visiting. An advanced Happy Easter to you.